A great experience, honest no nonsense advice, great cats and a fantastic experience all round, would thoroughly recommend. Have just brought my Ford Fiesta from them, have been so happy with the service I have been given! Very helpful and understanding, and couldn't be more happy with my purchase! Even giving the car a full service, going above and beyond for me and helping me make my first car purchase! Would recommend to anyone looking for their first car or any car! I’ve never found car dealers, especially independent ones, to be a joy to deal with, but Vivian Price Cars were an absolute joy. Over the course of a couple of months, I was advised on stock that was arriving, after we spoke about exactly what I was after. Once I was ready to make a purchase, it was smooth and with peace of mind in case I had any further questions, which I wouldn’t hesitate in asking. The car I got has been fabulous so far and I would recommend anyone take a look at his stock and consider buying from Vivian Price Cars. Grandson selected a car on 7th May, test drove it, was told it was going for MOT work and service on 8th and would definitely be ready on 10th, on the 8th grandson decided he wanted a different car, contacted VIVIAN PRICE CARS, not a problem was their reply, returned to the dealer on the afternoon of the 8th May, and after doing the deal within 30 minutes we were on our way home, a very happy grandson and grandfather. An honest car dealer, we highly recommend them. Not a cowboy dealer. Thank you VIVIAN PRICE CARS. 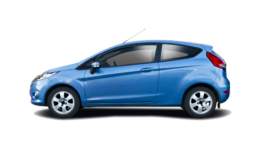 Bought my Fiesta from Vivian Price Cars on Tuesday, the whole process was incredibly easy and stress free. The cars are incredibly high quality for the price being paid and there was no hard sale to be made. The car came with a brand new MOT and 3 months vehicle cover, so you feel you can really trust the advise received and purchase. Quick, efficient, friendly, gave me a great offer for my car and they even came to collect it! Stuart went out of his way to give me advice - I would recommend this company to anyone. Vivian Price Cars customers can leave us a review on our Facebook and AutoTrader pages. We also welcome feedback directly. Please use the form on our Contact page if you’d prefer to send your review in person.